ok, i know i have been lax on the emails but finding internet access has been harder than i expected and much more expensive (venice = $10 per hour!) now i am sitting at a free computer at the tourist office. i have travelled through london, paris and venice and now am in my fourth location. london was lovely. i visited my good friend sean and his wife in their lovely home and attempted to focus my travels on ethnic london, visiting brick lane, a bangladeshi community, and brixton, a carribean community. london is bustling and weathly. there is gentrification everywhere which is sprucing up the architecture and leading to the rebirth of whole new areas of the city. i was struck by how historic everthing in paris is. its amazing that they have been able to keep it so beautiful and fight the development forces. i do think that i was best not born in the ages of kings. those houses seem awfully big and cold, compared to my small cosy tastes! for a waterfront advocate there could be no more perfect place! i rode the ferries so much that i began to sway on the sidewalks. i basically explored by boat and would just get off at stops i had never been to and see whats around that area. it worked really well, since i was able to escape the MANY american tourists and see where real venicians lived. i have never been somewhere so magical. the buildings are ornate. the islands are charming. i went out and watched glass blowing and sat for many hours reading the paper over yummy italian food. ok, now to a really cool place. this is a lovely little city brimming over with charm. 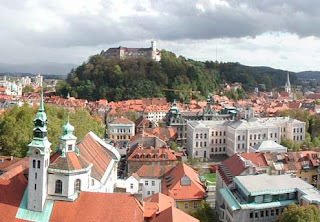 there are tons of outdoor restaurants surrounded by historic buildings under the gaze of a castle on a hill. the people here are very nice and seem quite well to do. this has always been a wealthy hamlet that was part of yugoslavia. on my first night here, i arrived at the coolest hostel in the world! its in an alternative arts area and was a former prison that has been beautifully renovated by a team of artists. each cell/room has its own individual design. they still have the original metal gates. in the lobby of the hostel there is a bar and a restaurant. there was a fantastic band on the first night along with one of the soccer games in the euro 2004 tournament. the place was hopping. today, i am wandering around. tomorrow is their national holiday, so tonight their philharmonic will play beethovens 9th and the streets are supposed to be alive with more activity. tomorrow i am off to budapest!